About a year ago, I wrote about our lab, which at the time was a year old. One year later, we have made even more improvements to our lab and upgraded our showroom to include rings (not just diamonds), and we’ll soon be showcasing our diamond studs as well. Whilst we made quite a few changes to our lab in 2007, we only made a couple of changes to our lab in 2008. From the picture, you can see that we installed a new monitor and phone. 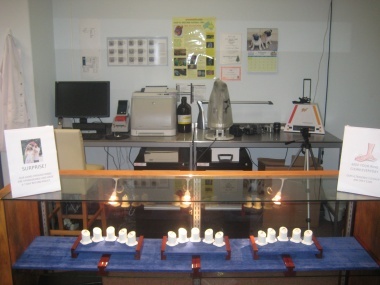 In 2008, we acquired an AGS ASET camera, which now replaces the Ideal-Scope for all diamonds. We received a stand-alone copy of the AGS performance grading system. Even though we already had a version of the PGS integrated into our OGI machine, there was a bug that gave every fancy cut stone a “5” for the girdle, meaning it was pretty much useless. 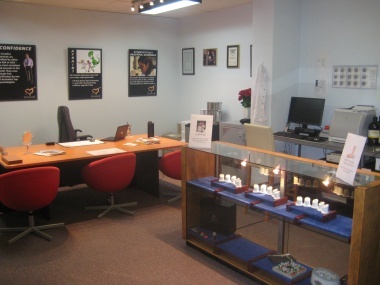 The main change however, was not in our lab, but our showroom now has a showcase full of rings, and will soon be displaying earrings as well. Our showcase isn’t quite complete yet, there are still more rings to come, as well as earrings, including some award winning earrings. Our showroom is open for appointments, Monday to Friday, between 10AM and late. This entry was written by Nikhil Jogia and was posted on on Wednesday, February 25th, 2009 at 1:14 pm	and is filed under Taking Care of Business. You can follow any responses to this entry through the RSS 2.0 feed. You can leave a response, or trackback from your own site.